3 Bedroom Cabins in Gatlinburg are the ideal Cabin for a Family Vacation. Three Bedroom Cabins offer plenty of room for your family. Choose from our selection of affordable 3 Bedroom Cabins in Gatlinburg and Pigeon Forge TN. Enjoy your Smoky Mountain Vacation with Heartland Cabin Rentals! New to our program! This spacious 3 bedroom cabin located between Pigeon Forge and Gatlinburg will be a great location to make family memories or a great couples retreat! Privacy for everyone. Each level features a bedroom and bath. You will enter the cabin on the lower level into a large game room with a pool table, sitting area, and flat screen TV. This level will also have a queen bedroom with a full bath. On the patio area will find the hot tub to relax in after a hard day of playing in the mountains. 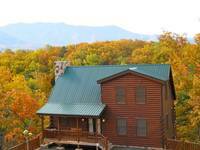 Across The Smokies is a quaint and cozy Gatlinburg cabin with 3 levels. This cabin has the comforts of home. Now with WiFi! 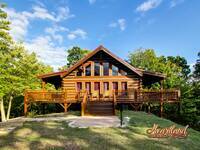 A perfect cabin for you and your family!